Ever wondered how best to flatter your body shape? You can tone up all you want, but at the end of the day you may still have wide shoulders or ample cush in the tush. 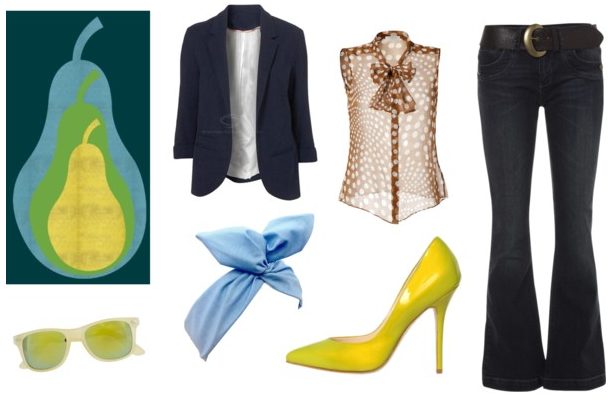 Last month on Chic Galleria, I focused on how to dress four popular shapes: the Apple, Banana, Pear, and Strawberry. Check it out! Feel free to leave your own tips in the comment section, here or on CG. If you tend to carry weight in your stomach and arms, have lean legs, and narrower hips, then you’re an apple shape. With this body type, the favored feature is often the legs. 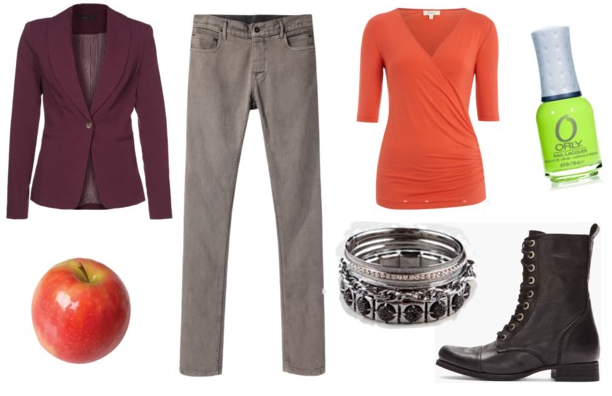 Apple legs tend to be lean, whether or not their long, so tapered, skinny, or straight-leg jeans can be an excellent base. If you wear these, however, be sure to balance them out with a heavier shoe — like this trendy combat boot from Deisel. Pencil and A-line skirts with thick waist bands will help hold in your tummy and draw the eye downward. You may have slim arms, too, and if this is the case, you’d do well to show them off in sleeveless shirts: just make sure there is structure throughout the rest of the top. Make blazers and wrap-tops your best friends. An open blazer will create a vertical line to add length to a rounded middle. A closed one with an hourglass tailoring will create curves in all the right places! For less structure, try empire-waist tops and trapeze dresses. These will hide your midsection and draw attention to your legs instead. As with any shape, it can be fun to draw focus toward other great features. If you have thin, dainty wrists, try pairing large bangles with neon nails. Do you have great hair? Pretty it up with a flower clip or a rhinestone barrette! If you tend to carry weight evenly across your body, have a straight torso, have narrow hips and an undefined waist then you’re a banana shape. With this body type, it’s important to create an identifiable waist. Without one, the severity of your straight up-and-down figure will detract from your assets. Bananas were born for draping fabrics. Characteristically feminine ones such as silk, lace, and chiffon can add both texture and curvature, adding volume where needed. Look for embellishments such as bows, ruffles, peplums, and ruched seams. These are especially useful across the bust and hips, where they’ll help to create more of an hourglass shape. A-line skirts will add curvy volume, but if you’re happier in pants, try a bright pair of skinny jeans and a top in a contrasting color. The two tones will separate your upper half from your lower half and help define your waist. Belting a high-waisted skirt or pant will look great on the shorter banana shape, while taller bananas can pull off hip-hugger styles with a wider, low-slung belt. High necklines look marvelous on you, especially if your bust is smaller. Horizontal stripes can even out a long torso! Wearing long necklaces will also help create curvature which mimics the hourglass shape. These Lucky Brand and Betsey Johnson necklaces have long, arching layers which draw the eye downward and give the illusion of a narrowing waist. Finally, don’t forget to show off those lovely legs in a pair of bright pumps — perfect for welcoming in Spring! If you tend to carry weight in your rear and thighs, have slim shoulders and arms, and maintain a defined waist, then you’re a pear shape. With this body type, it’s important to draw attention away from the hips and thighs. An easy way to do this is by balancing out your upper half with shoulder and collar details, such as the bow on this patterned Steffen Schraut blouse. A slimming blazer cut just below the hips will help create vertical lines through your widest region. You will also benefit from wearing slimming boot-cut or flared jeans in a dark wash. This Jane Norman flare uses an over-sized belt to shrink the waistline. Fun accessories such as sunglasses and hair adornments will draw the eyes upward and balance your silhouette. Finally, add a pair of heels to create length through the legs. I love this “pear” by Guiseppe Zanotti! If your shoulders are wider than your hips, you have a slim lower half, and little definition between your waist and hips, then you’re a strawberry shape. With this body type, you want to focus on widening your lower half to balance your upper half. This will help create the classic hourglass shape. Adding volume to the hips in flouncy a-line skirts and dresses is an easy way to do this. For tops, look for narrow v-necks and dropped shoulder seams, as seen in the camisole and shrug above. These accents will soften the horizontal line of your shoulder and instead draw the eyes downward, toward your slim waist and legs. You also look great in well-tailored button-down blouses. Again, look for vertical patterns such as pinstripes to add length. Using monochromes above the waist and brighter colors below the waist will also help emphasize your lower half. Due to your slim hips, you can get away with mid-section accessories such as wide belts. Keep in mind, however: this added width will shorten your torso if worn above the waist, as in this Balenciaga skirt; you might be better off wearing lower-waisted styles. If you legs are longer, try working a pair of wide-legged pants. Remember to balance your sweet shape with sassy accessories, like these snakeskin Jimmy Choos and cat-eye glasses from Norma Kamli!